I am back. Sorry that I have been so quiet for the last few weeks. I don’t have any real explanation. Excuses may range from work commitments through some form of ‘writer’s block’ (where has my muse gone?) 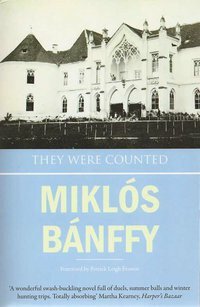 to the genuine excuse of being totally absorbed by Miklos Banffy’s first volume of his trilogy – They Were Counted. This is an exceptionally good book. I will write about it at greater length at some future date, but I do recommend it. He can sometimes get a little bogged down by Hungarian politics, but when he gets going, describing balls, duels, gambling and love, he really does have a very fine style. Paddy wrote the forward to the English translation whilst staying at Chatsworth during Christmas 1998. Much of the story is set in Kolozvar (Cluj) and our old friend the Hotel New York, where Paddy and Angéla went for a cocktail, is frequently mentioned. We have just had a blog anniversary. 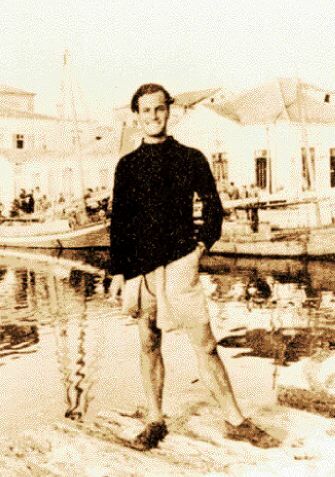 The Patrick Leigh Fermor blog started in late March 2010. In that time it has reached almost the very top in any Paddy search you care to mention. There have been over 64,000 visits, 156 postings, 206 comments, and there are now well over 100 subscribers (you can sign up in the top right of the home page so that you receive future posts by email – no spam). When I started I wondered if there would be any interest in our heroic and talented subject. There were just a few dozen visits in the first month. But visits grew rapidly to a peak of 9,400 in January 2011. We now track at nearly 7,000 visits a month on average so you are not alone in your interest in The Greatest Living Englishman. I am extremely grateful to all of you who have got in touch with me with messages of support; offers of information; and especially to those who have sent me material to publish. I can assure you that there is much more material (I have over 60 items in various stages of draft) and it will come in a steady stream. To one of you, please be assured I remain your #1. Finally, let’s not forget why we are here. Paddy is now 96 years of age and, as far as I can tell, in reasonably good health. I am sure we wish him all good health and pray that he is working as fast as he can on that third volume. It is without doubt one of the most eagerly anticipated books of the decade. Why not visit some of our top posts? Patrick Leigh Fermor – star of the silver screen? This entry was posted in A Time of Gifts, Between the Woods and the Water, Ill Met by Moonlight, Interviews with Paddy, The Roots of Heaven, Video, Volume Three - The Broken Road and tagged A Time of Gifts, Between the Woods and the Water, Crete, George Psychoundakis, Patrick Leigh Fermor on April 1, 2011 by proverbs6to10. I am truly delighted to have found this website and bloggery devoted to a man who even towers over the coterie of my heroes. ( the ” narvik ” in my e-mail address refers , of course, to that port in Northern Norway, where my father fought in the 1st Battle on 10 April 1940. I was born nine months later and have, ever since, developed a healthy interest, not to say strong regard and respect for all those who fought in WW2 to keep us British). Fielding’s ” One Man in his Time : the life of Lt. Col. NLD Billy McLean DSO “. All these chums of yours are also heroes of mine and not just for ereasons of WW2. As a student of ” small wars ” since 1945, in some of which I have served in the 1960s , all East of Suez, I recognize the huge contribution made to our nation’s interests by such men as these. Funny isn’t it , that today, as I write, Yemen is in the news again, as a risky littoral owner to the North of the entrance to the Red Sea, thence Suez Canal, thro’ which flows one hell of a lot of oil and, now LNG- liquid natural gas. And to the South lies the failed state of Somalia, now home to a spreading scourge of piracy, unseen since the early 1800s Barbary Coast. To be fair to Somaliland, which is in fact the South littoral owner of this vital ” choke point “, it is not a failed state and is more stable than its Southern neighbour. My point here is that David Smiley and his ilk – Johnson et alia – put up with a deal of discomfort and patience to keep these waters and then. later these lands, as in Oman, stable during years of insurgence from Egypt’s Nasser and Yemen’s Chinese-trained and Russian -supplied dissidents infiltrating Dhofar, that southern part of Oman. Oman , dear reader, is the Sentinel of the Arabian Gulf, thro’ which flows 40% of the world’s oil and which faces Iran to the North across the Straits of Hormuz. This was the reason for that secret war between the mid 1960s and 1976 fought in Southern Oman , named the Dhofar war, of which so many know so little. The Battle of Mirbat on 19 July 1972 suims it all up, by now being named the ” Rorkes Drift ” of the C 20. Nine members of the SAS plus a group of Omani soldiers kept some 300 and more “adoo” = enemy at bay from first light until later that day, when RAK Strikemaster aircraft were able to penetrate cloud and scream low over attacking forces. The second and decisive event was the arrival of the relieving SAS Squadron, from whom the BATT – British Army Training Team – gettit ?? ?- were deployed – who got there in the nick of time with additional firepower. It was a close run thing and not too many k now of it….. as with Paddy , David Smiley , Billy McLean and many others. A second champagne cocktail is raised to them all. Thank you for this splendid tribute to a special Briton. Richard – thank you so much. That peninsula was a very interesting place 40 years ago and as you say it is all back again. It only takes a generation or two to recover and start again. Many great men gave so much. Don’t forget to subscribe to the blog so you keep up with all the postings – simple button to press top right. I’m thrilled to see someone else taking on Banffy’s Transylvania trilogy – the highlight of all my reading year last year (and maybe last decade). I look forward to more of your comments on it (and of course on Fermor, who’s ultimately responsible for my stumbling onto Banffy in the first place). Spent the last 2 weeks in a little house opposite of Kardamyli in the Kalamatan gulf, sending good night blessings to Patrick Leigh Fermor each evening. Kardamyli (which you can’t see in the distance of about 10 miles across the water) is at the right side end of the darker shadow in this pic, the shadow being the small low peninsula of cape Kitriés – above it the Taýgetos with last snow on it’s peaks. Yes it all works. Thank you Brigitte. I am off to Wurzburg later this week. Have a good time and don’t miss the castle Festung Marienberg and it’s museum. Congratulations on a year of blogging about Paddy. Thanks Maggie – hope all is well with you! Keep us updated on your writing.